After 3 years of creating some major European league competition template for excel with the same layout, I thought about making new ones with more features, for example, add information about any teams previous matches, display any team matches in calendar form, etc. And, while thinking of re-designing the layout, there was an idea to make a tool which can be used to generate any soccer league tournament or to be used to map any of league competition around the world. And this Soccer League Creator Template for excel is a result of those thoughts. With this tool, I can easily create those Italian Serie A, Spanish La Liga, German Bundesliga, French Ligue 1 and Dutch Eredivisie without touching the codes inside excel. And if you run your own soccer league, either real soccer competition or just playstation soccer competition, this tool will simplify your matches arrangement process. You can speed up the process by entering your custom parameters, for example, points value for win, lose and draw, season start date, matches cycle (from daily until biweekly), team names, etc, and this tool will do the rest. This tool also suitable for you who want to map your country or local league competition. Use the Soccer League Creator without fixtures generator version, and you can easily map your competition manually. There are some European League competition samples that you can download in this site to see how this tool works. But remember, you are not allowed to map any league competition under England FA, such as Premier League, or within Great Britain territory since you have to pay for a license to map those fixtures. It can accommodate 6 – 36 teams (Lite version only accommodate until 10 teams). 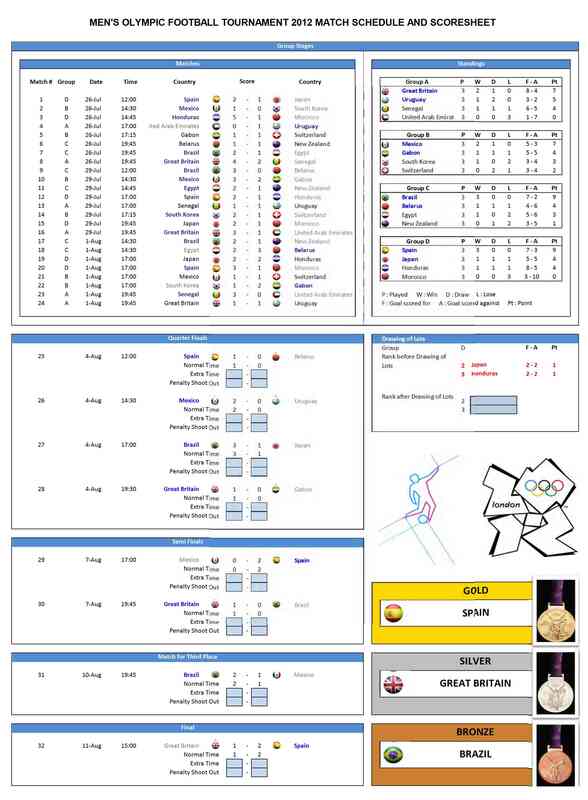 And with its default one-page layout, you can easily see, print and distribute this information among teams who participate in this competition. Visualize all team matches in one year calendar, and add holidays consideration to re-arrange any matches to suit your available time. There are 5 match dates cycle you can select. You can set time between matches from daily, twice a week, three times a week, weekly until biweekly. You can set different points value for home and away win, draw and lose. There are useful information available in matches worksheet, besides dates, team names and score boxes, that you can use to evaluate your team performance. Those are last 5 matches, current standings, and previous head-to-head meetings. There is a reschedule matches worksheet that you can use to monitor any rescheduled matches. This tool is not free. But, before you purchase the full features one, you can download and evaluate the Lite version. All lite and pro version are password protected. So, you can use it as your tool but you cannot modify its layout and access its codes. If you need to customize its layout to suit your needs, you can purchase Excelindo Soccer League Creator Template Pro Password to unprotect Dashboard, Setup, Standings, Team Info, Matches, and Calendar worksheets. Remember to backup your file in case you break some formulas in while you’re working in unprotected worksheets. i bought full version but i don’t received the password! You don’t need a password to run the tool, except you plan to modify the layout. I am planning on buying this version, I am just decided between the fixtures generation one and the one without the fixtures generation. Can you please specify what is the difference? When you buy the full version, you will get both with and without fixtures generator. The one with fixtures generator will generate all matches automatically, once you finished typing all parameters in setup worksheet. It is more suitable if you are running your own league. The without fixtures generator will need you to fill all matches date, time and team manually in matches worksheet, where you have to do this in every worksheet. It is more suitable for you who plan to map existing league which already being scheduled. Thanks a lot for answering. Yes indeed I just purchased the full version, however I need to make some further modifications to the league I am creating, but all sheets are locked. Thank you for buying the full version. All people who bought the Pro version are asking password for customization 🙂 where they eager to pay to get the password. I’ve just put a paypal button for buying a password which will make you to do further customization. Remember to make a backup of your file, in case you break some formula while you’re working in unprotected worksheets. @ Anonymous: The password is already available to be bought. You can proceed by following the paypal button for password. But, you need to re-download the file again using the same link given in the notification email. Thanks. you have to modify that formula. Other question on file “about” the version indicate 1.96???? Noted. I will find another formula which will eliminate the problem if it is used with different language version of Excel. The “ddd” is the custom format which use the first letter of “day” in English version. In Italy it should be “ggg” where g is the first letter of “giorno”. I will post the newest one within a week. 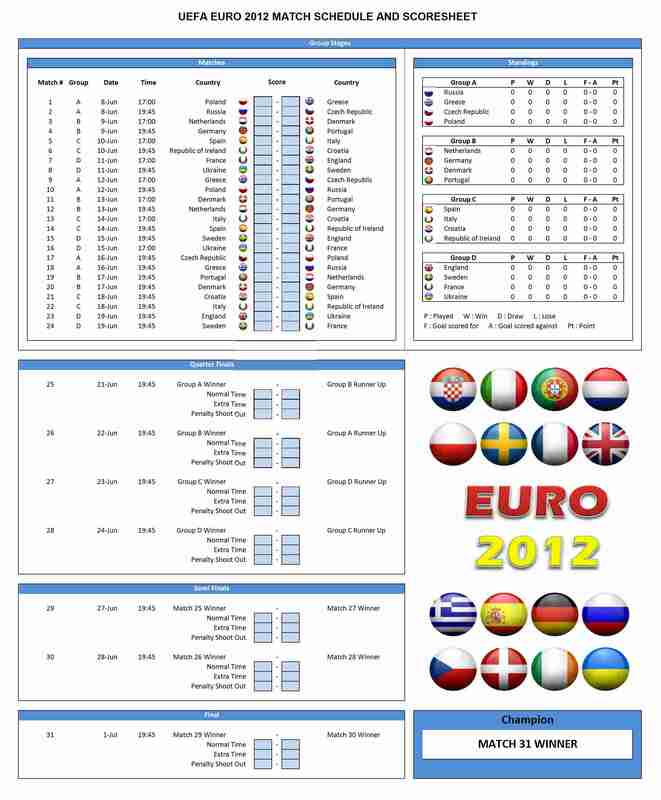 All European League templates are built upon Soccer League Creator version 1.96. The features in that version is enough for building the European League competition. The newest version for the Soccer League Creator Pro is 2.11. I downloaded Soccer League Creator Pro 2.11 however I’m having trouble doing leagues which are 10 or 12 teams for example where the teams play each other more than twice – in your spreadsheet the formula is just for playing one another at home and away so therefor would be far shorter than I need. I have tried the Lite programme and it is excellent, except the fixtures are a little strange. Some teams play 5 or more consecutive away games (or home games) – does the Pro programme space out the fixtures to be more even? Can a tie break option be a head to head one? Also on the Dashboard can the bottom right space be used to record say cup ties? I assume the pro password programme only needs to be bought if you intend changing the current set system? 3. The weekly standing table always ranks by point > overall GD > overall GS, no matter what tie breaker regulations I choose. @Chris: The fixtures generator doesn’t support more than two matches at this time, but you can do it manually. Could you send me an email about your specific needs, so I can assist you to make that customization. Thanks. @Dave: The Pro version still have the same fixtures arrangement, but I plan to make a balanced round matches in the next update. And about dashboard or week matches customization, you can do it by yourself if you bought the password :). Thanks. 1. Noted. I’ve checked the chart and I found an incorrect reference in the chart. I will correct it and send an update email so you can download the new version. 2. Could you give me an example? If the markers automatically adjusted, it could be caused by a slow process in Excel which made the updating process not done as soon as you update the value. 3. You are correct. The weekly standing table won’t follow the tie breaker method, since the tie-breaker method only applied in the last matches, and displayed in Dashboard and Full standing table only. I will put a notification in the file guidance worksheet. 4. Basically, that is a Microsoft Excel 2007/2010 bug :). You can google about this chart topic since many Excel users are having the same issues while working with Charts. But, you don’t have to close and open the file to reveal the chart, just scroll down or right to make the chart out of your screen display and scroll it back again and you will see your chart is appeared again. When switching to calendar view, you’ll see both teams have a red “12” with a green frame. @Honeybees: Thank you for your correction. It is fixed now. I will send a new download link in one day. @Dave: I have updated the new version to have more balance home and away matches. Your feedback is super fast! Yet the chart-view issue looks unresolved. 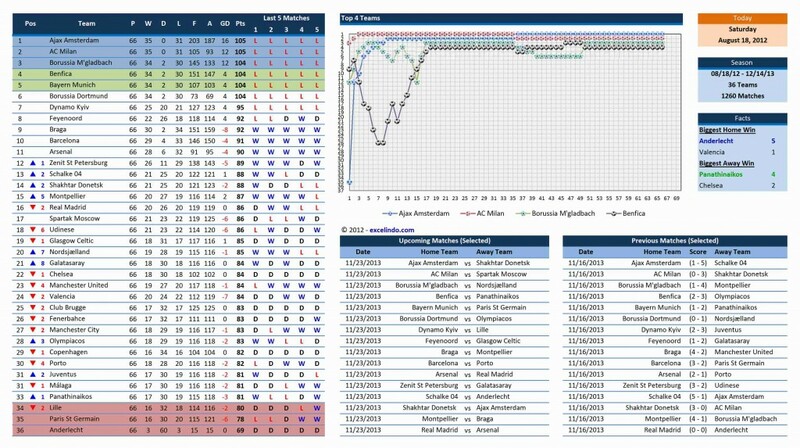 Now every team (expect team 1) has a fixed 70-week chart regardless the length of the season. I have updated it again. The chart is fixed now. You can download it from the same link and try it again. Let me know if you still found some errors. @Musadya: The download link has expired…..
@Honeybees: Try to reply the update email that I’ve sent to all SLC Pro buyers, so I can activate it again. Thanks. Musadya, many thanks for the response and the updated programme – the fixture query has been sorted and I have now downloaded the password – let’s have some fun now. Can’t wait to experiment with different leagues (including some fantasy ones) and the ever changing league table on the same page is immense. Cheers. I found some minor errors in v2.26 when creating a league with 11 teams, which means there’s always a team going for a bye in each week. There should be 22 rounds for the whole season and each team should play 20 matches. Now for the team having a bye in the 1st round, the calendar view shows nothing but “###”s. Also the weekly chart views of every team consist only 20 weeks, which means the standing curve in week 21 and 22 cannot be shown. For the tie breaker regulation, is it possible to add one option – 1 5 6 7 2 3, as used in Spain La Liga? @Honeybees: Thanks. That is a very sharp observation. I missed to modify week chart reference for odd number of teams. I will update it and inform you soon. About the tie-breaker regulation, modify the current regulation is easier than add more regulation. Because I have to reconstruct all table formulas to accommodate one more regulation. And I need more spare time to do it. I will think about it. Regards. Aaagh! I have put in all the detail for a 24 team league and have played a match. However when I want to click on a team (to see their full fixtures)or to advance a week or a date to view a set of games I get: Microsoft has identified a potential Security Concern (Hyperlinks may be unsafe). It asks if “I want to continue” and even though I say yes it says it “can not open specified file”. Any ideas please – I have a password. Musadya, Silly me – you have probably mentioned this before to others. Have done what you say and it is working fine. Many thanks – it is a brilliant programme. I have bought the password and just need to work out where to use it – but I will perservere as I don’t intend changing much, if anything. Musadya, I find another minor error. Is there any way to change the dates? for example i want to have weekly basis games but every three weeks i want to have off…is it possible? what about barclays premier league ? Can I please ask what the upgrade policy on this? If I buy the full version (and the password) am I entitled to any upgrades? Musadya has explained earlier that the miserable bunch at the EPL (the “Greed is Good League”) won’t allow the fixture list to be used in any game/setup without a fee being paid. 1 Change the “last 5 results” that show up in the weekly fixture list to allow times (and/or scorers) of goals – I have a system to replay a whole set of fixtures all at once – instead of a game at a time – and this would record all the details. 2 Can the team league standings – as shown in the weekly fixture list be altered to put in half times instead? 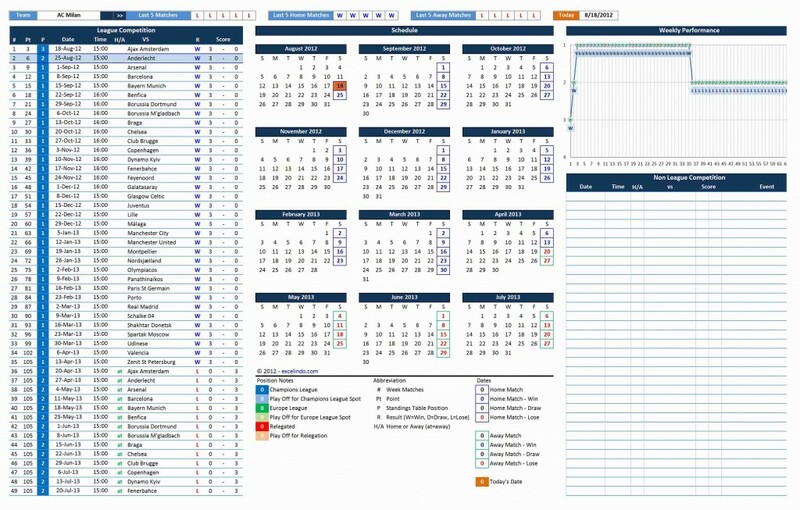 This is a brilliant spreadsheet and well worth paying for the full set up, believe me. I have had great fun downloading the various Leagues (and sometimes changing them to suit local amateur and junior associations) and playing matches with my system. I have purchased the file and the password but the password does not allow me to edit the league reference and dummy sheets which i need to adjust for my use. Please advise. please i want to buy the full version ? I am the Match secretary for an association is South Africa. We have about 20 Leagues. Is there a facility whereby the system detects a clash of fixtures for teams that use the same stadium? I’ve just bought the sheet, and I have filled in my data and team names etc. Now I am not allowed to jump between the weeks – I’m getting a message that the file cannot be opened. Can you help me? I’m reading many good things about the pro version but want to check a few things first. I see above somebody said that some team get a bunch of home games in a row and they wanted a more even draw. – finally and most importantly, when using the trial version (lite) when I go to save, excel displays “a significant amount of functional errors” there is a lengthy scroll bar with about 50 errors and will not allow me to save as is. If I choose to save then nothing works next time I open. I have tried saving as over 10 file extensions. I have windows XP on one computer and Windows 7 on another and both have Excel 2007. Re-rank cells will be shown in standings worksheet only when the score is typed in matches worksheet and there is more than one team are sharing the same points, goals difference and goals scored. Hello Im currently in charge of keeping the standings for a league that has 4 divisions. I dont need the fixture generator. What program would you best recommend? I’ve discovered another small flaw, if you choose a half competition when you go to the ‘Team Info’ sheet only the first half the teams show up at the top. Though you can use the arrows underneath to scroll across to the remaining teams info. Though it’s a very small flaw in an otherwise brilliant league table generator spreadsheet. Im planning to buy the pro. But one question: Is this only for leagues? or knock-out tournaments as well? I purchased the pro versions today however, when I try and save them I get major errors showing in compatability checker, when I reopen I then have erros in the team info, only the first one works? I would like to buy this excel, but I have no Paypal account, and I do not want to create it. Is there any other possibility to pay for this file? data from the results page. Can I upload to google drive and share the information with my friends? @Obede : Sorry, it is protected. You will get error message from google when you uploading it to google drive. I have just purchased the pro edition and it is excellent. Thank you for creating the file. I am sorry, current tie-breaker combination are the only available option you can select. Adding new combination set is possible but requires hours to tweak its main excel function. Due to limited time, I don’t think it is possible to create it in this point of time.